The Barber Institute has a significant collection of Roman coins. These include both republican and imperial issues, as well as a substantial number of Roman Egyptian tetradrachms. The Barber’s Roman coins total just over 5,000, out of the 16,000-strong collection. Roman coins are considered to continue until the reforms of Anastasius I (491-517) in 498, whereafter the coins are designated as Byzantine (for which see here, or for the Early Byzantine period (491-c.830) see here). Coins produced between the death of Julian (363) and the accession of Anastasius I (491) are considered as Late Roman. Octavian becoming Augustus marks the line between the Roman Republic and the Roman Empire (both numismatically and historically). The majority of the Barber’s Roman coins come through the donation of Geoffrey Haines. The Barber also possesses just over 1,000 Roman Egyptian tetradrachms through the donation of Philip Whitting. While the Roman Republic’s monetary system was essentially bimetallic, using silver and bronze coins (gold Republican coins did exist, but were extremely rare), the Roman Empire functioned on a more trimetallic, and in the early Empire quadmetallic system, using gold, silver and bronze (and orichalcum for the early Empire). 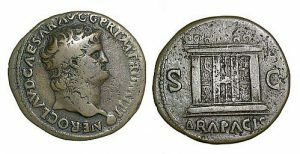 The coinage of both the Roman Republic and the Roman Empire was incredibly varied. In the Republican period, different moneyers produced coins for various senatorial families. In the Empire, coins were struck in the names of various members of the imperial family, including wives and daughters. For the majority of Roman history there were also various mints striking coins for the Roman economy with their own individual quirks. There were also, however, semi-independent cities whose coinage is known as the Roman provincial coinage. Roman provincial coins were often not in Latin, but usually still in the name of the emperor. The vast majority of the Barber’s Roman provincial coins are the Roman Egyptian tetradrachms. The Roman coinage was incredibly influential in the development of later medieval and modern European, and some West Asian coinages. The Byzantine Empire considered itself a continuation of the Roman Empire (indeed, the distinction between Roman and Byzantine is an entirely modern fabrication), so its coins are necessarily a slow development from “Roman” to “Byzantine”. For the successor kingdoms in the West, however, the Roman coinage still exerted a strong influence. Ostrogothic coins depict the head of Roma, and sometimes the wolf and twins (Romulus and Remus), even though the Ostrogoths themselves were Christians. Similarly, the Vandals continued to use depictions of Carthage as a female figure, closely resembling Ceres-Tanit, the goddess of agriculture. Even groups such as the Turkic Muslim Artuqids used coins depicting Janus. The profile laureate bust was used on most European early modern coinages, and is still influential in the portrayal of the UK’s monarch on coins, and the Netherlands’ monarch on Dutch euros and cents. Rome’s denarius also lent its name to the medieval Arabic dinar, the currency of a number of modern states.